Earlier this week I reached out to her and asked if there was a recording. Of course. It is a TED talk. Ideas worth sharing. One thing I didn’t know was the results from the Gottman research on married couples. It states with 90% accuracy that the there is a 5:1 ratio of 5 positive interactions to every negative encounter in a successful marriage (at 12min 21sec in the full presentation below). Katia Sol has spent the last 18 years facilitating leadership, community development, and transformative educational programs in more than 30 countries and with several First Nations around the world. An award-winning scholar and writer, she led the development of Ghost River Rediscovery’s International Youth Leadership Program and is a current co-facilitator of the Ecology of Leadership program at the Regenerative Design Institute. 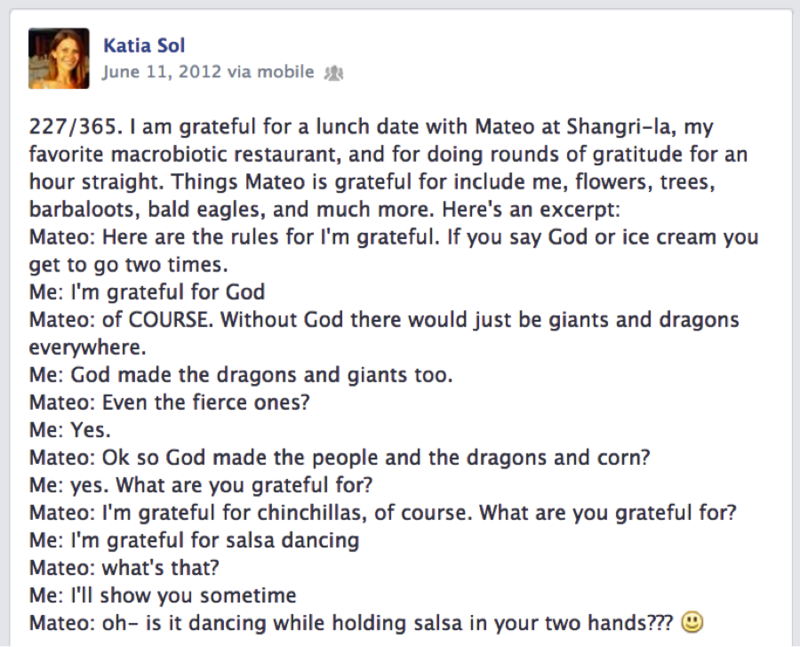 Read more about her here: www.katiasol.com and join her Gratitude Thanks Giving Yoga Retreat November 22-24. Thank you for sharing Katia! Gratitude is something I could not live without. For me it has been transforming and beautifully informing in nature. Every time I say I am grateful I am privy to see more of what I am grateful for. It is a gift that keeps on giving. Just thinking about it makes me smile. 🙂 What a wonderful topic….I totally recommend stating your gratitude every morning, as soon as you open your eyes so you have whole day to see what you are grateful for. Thabnks Johanna for bring this to your blog…….. Wonderful. Thank you Donna! That is wonderful to hear.